The holidays just aren't the holidays without eggnog, or so some people say, but what if you need a non alcoholic eggnog recipe? This can be tough to find if you don't know where to look. While you can always simply purchase eggnog in the grocery store, it can be fun to make it yourself, especially if you involve the entire family. Just follow one precaution; never put raw eggs in your eggnog, especially if young children or pregnant women will be drinking it. In a saucepan, crack 6 of your eggs along with the yolks only from the 2 eggs you separated. Use a whisk to mix as you add in the salt and the sugar. Slowly pour in the milk while you continue to stir. Next, place the pan on the stove and turn the burner on the simmer setting. Stir the mixture constantly until it thickens enough that it begins to stick to the whisk. You may want to take turns with this task since it can take up to an hour. If you need to hurry things up a bit, you can increase the temperature slightly. 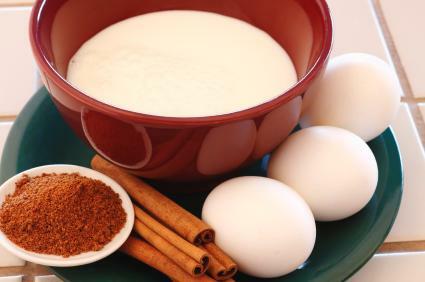 Once your eggnog has thickened, remove it from the heat and add in the vanilla and 1/2 of your nutmeg. When the mixture is cool enough to pour, put it in a container that you can cover and put in the refrigerator. Let it chill for 5 hours until it becomes a rich custard. In a glass bowl or metal mixing bowl, whip the heavy cream just before it's time to enjoy your non alcoholic eggnog recipe . Next, pour in the custard mixture. Stir until the mixture is uniform, and then transfer it to mugs for serving. Top each drink with a dash of nutmeg. This should serve between 12 to 15 people. Make sure you refrigerate any leftovers and drink them within the next 48 hours. Substitute soy milk or almond milk for regular milk. Use cinnamon or cloves as a substitute for the nutmeg. Add 1/2 teaspoon of flavored syrup, like chocolate or caramel. Put in 1/4 cup of ground almonds or cashews. Garnish each mug with a candy cane that can double as a stir stick. Use more or less sugar to taste. Instead of using eggs, substitute a package of instant vanilla pudding. Rim the glass with granulated sugar. Serve your drinks in snifters instead of mugs. That's really all there is to making a batch of non alcoholic eggnog. Since working with eggs can be a little tricky, you may want to practice making this recipe a time or two just to make sure you get the consistency right before you try serving it to your family and party guests. Once you get the hang of it, you can incorporate this drink into your holiday traditions.